Jason Middlebrook is a mixed-media contemporary artist who works in sculpture, installation, site-specific projects, painting, and drawing. Here is a short list of a few of his accomplishments: Received his BFA from the University of California at Santa Cruz in 1990 and an MFA from the San Francisco Art Institute in California in 1994. Middlebrook participated in the Whitney Independent Study Program in New York from 1994 to 1995. His work has been exhibited at the New Museum, New York; Whitney Museum of American Art, New York, NY; MASS MoCA, North Adams, MA; Museum of Contemporary Art, Chicago, IL; Aldrich Contemporary Art Museum, Ridgefield, CT; The Contemporary Austin, Austin, TX; Eli and Edy the Broad Art Museum, Michigan State University, East Lansing, MI; Addison Gallery of America Art, Adover, MA; Nasher Sculpture Center, Dallas, TX; Palazzo Delle Papesse Centro Arte Contemporanea, Siena, Italy; Santa Monica Museum of Contemporary Art, Santa Monica, CA; Weatherspoon Museum of Art, Greensboro, NC; Wellcome Trust, London, United KIngdom; Museo de Arte de El Salvador, El Salvador; and the Aspen Art Museum, Aspen, CO.
Middlebrookʼs work has been reviewed in Artforum, Art in America, Modern Painters, The New York Times, Sculpture Magazine, Art Issues, Village Voice, Los Angles Times, LA Weekly, Time Out New York, Time Out London, and The Brooklyn Rail, among others. His work is included in the permanent collections of Addison Gallery of American Art, Andover, MA; Albright-Knox Art Gallery, Buffalo, NY; Altoids Collection, New York, NY; Arthouse, Austin, TX; British Airways Art Collection, Waterside, United Kingdom; Denver Art Museum, Denver, CO; Harn Museum, University of Florida, Gainesville, FL; Marte Museum, San Salvador, El Salvador; Microsoft Corporate Art Collection, Redmond, WA; Museum of Contemporary Art, Chicago, IL; Museum of Modern Art, New York, NY; NASA Art Program, Washington, D.C.; New Museum, New York, NY; Pacific Bell San Francisco, CA; Progressive Art Collection, Mayfield, OH; and Whitney Museum of American Art, New York, NY. 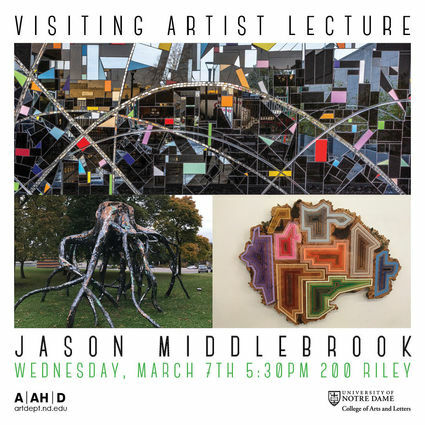 In 2013, Middlebrook unveiled a major outdoor commission at the Albright-Knox Museum. In 2014, his work was exhibited at Contemporary Arts Museum Houston, SITE Santa Fe biennial and Savannah College of Art and Design. In 2018, Middlebrook will install a commission in Mobile Alabama for the new federal courthouse. The commission is with the Government Service Administration. He was the recipient of The Joan Mitchell Foundation Grant and a Pollock- Krasner Foundation Grant. His MTA public commission, Brooklyn Seeds, was named one of the Best Public Artworks in the United States. Middlebrook lives and works in Hudson, New York.